ISTP has long led the way in incorporating technology into our teaching methods. The key issue educators face, however, is not simply to have technology present in the classroom, but to use technology in a meaningful way to facilitate learning. The iPad, especially, has been singled out as a technology with great educational potential. 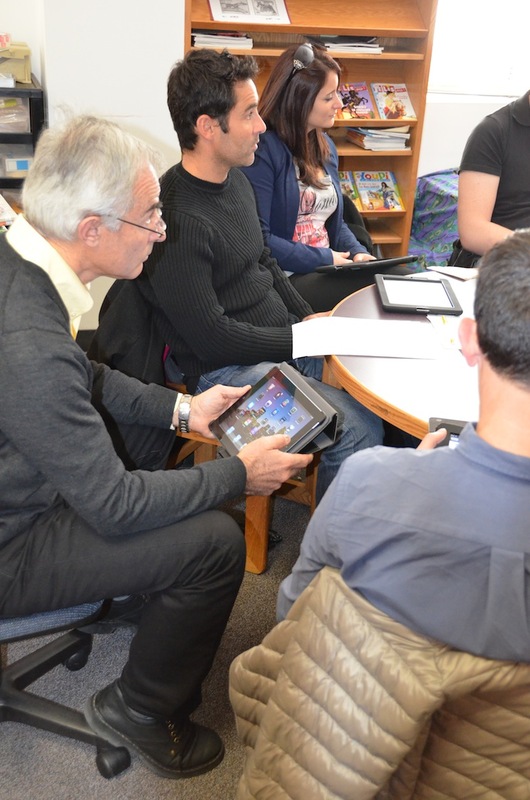 The AEFE – the Association of French Teachers Abroad – recently sponsored a two- day workshop focusing on how to usefully integrate the iPad into the classroom. ISTP, located in the heart of the Silicon Valley, was a natural choice for the workshop location. Twenty French teachers from all across the United States and Canada traveled to Palo Alto to participate in the workshop organized under the leadership of ISTP Technology Coordinator Véronique Merckling. Three of our own teachers also participated. Teachers came to learn about new educational apps and most importantly, to share their own experiences of using iPad apps to teach skills in their classrooms. Teachers shared their experiences with both language and math applications. One application that stood out as being particularly useful was a “Math without Words” app. The application takes an innovative approach in that it teaches mathematical concepts intuitively through numbers and pictures, without ever using written language. Teachers reported having great success with the app, which is especially useful because it can be used with students of any language, with any level of language ability. Véronique Merckling received overwhelmingly positive feedback about the workshop. Teachers especially enjoyed being able to learn directly from each other. Participants agreed to reconvene in one year to discuss their progress, and the new apps they have discovered in the interim – which in today’s rapidly changing technological landscape will inevitably be many.